If you’re too lazy to sweat it out on a real tennis court, why not pick up Wii Sports tennis instead? Heck, you might as well go all out for this pseudo-exercise regime with racket add-ons from tennis equipment maker Prince. These mini rackets are slightly smaller than the real thing, and I suspect they’re a real hazard to any home with highly fragile adornments lying around. 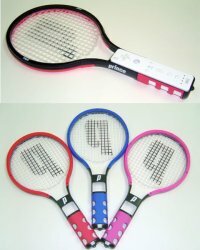 These Prince-branded rackets will retail for approximately $15 each and will definitely make any Wii Sports fan happy.